Mother's Day Celebration Ideas: Tips on picking the best gifts and planning the coolest parties! Mother's Day, the day meant for honoring the most hard working people on the planet that is the mothers, is almost here! Although mothers obviously deserve to be appreciated and loved throughout the year, a single day set aside just for them is both practical and very much needed. So, this Mother's Day, what're you planning to do for your mom? How about throwing a surprise party for her? A nice fun party is a great way of letting your mom know, just how much she is adored and loved by all. Throw in a cute gift that she gets only when the party is over and she will be over the moon. You can choose from a whole range of decorations, cards, tableware and gifts, all things needed to throw a super-awesome party that she won’t forget in a hurry. So, let's get started! Properly inviting guests is the first step towards making sure that your party is a success. 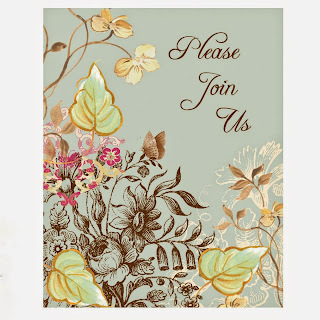 Invitation Cards make sure that your guests understand their attendance is needed as well as appreciated. You can go for pretty floral cards, which add an elegant touch to the celebrations. Pretty poppy flowers against a background of green leaves, can it get any better? These Invitation Cards are elegant and perfect for the occasion. 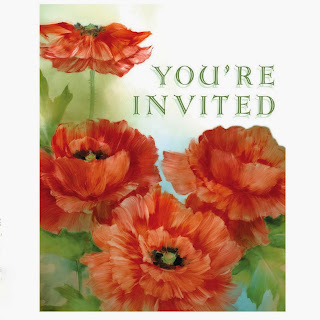 This Pack includes 8 Paper Invitations and Envelopes. Featuring a beautiful floral design that boasts of flowers and leaves, these Invitation Cards would be great for your Mother's Day Party. No party would be complete without the right set of decorations. Pretty and funky Decorations are the trend these days but for Mother's Day, we would suggest going for something more elegant. We've a range of pretty balloons, centerpieces, lights and other such decorations to choose from. So, take your pick! 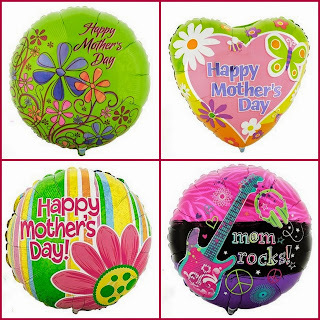 These pretty foil balloons are great for a Mother's Day party. Featuring cool designs and prints, they will definitely create the right party atmosphere. 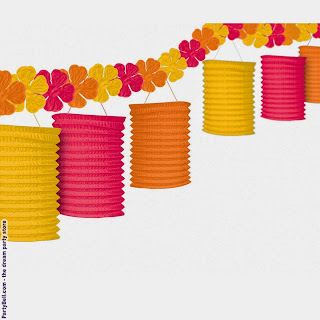 A string of colorful floral lanterns add a bright and soothing touch to the celebrations. In colors of red, orange and pink, these paper lanterns create a party atmosphere that is not over the top but is more nuanced and balanced. It includes 6 lanterns (2 red, 2 orange, and 2 pink) on a 10' flower garland. Centerpieces add grace to the occasion and are perfect for Mother's Day. We've a range of Foil Centerpieces to choose from. These are both pretty and economical. 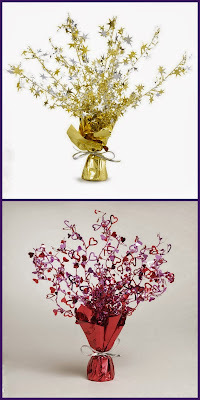 This Gold Spray Centerpiece and Hearts Spray Centerpiece would make for great table accessories for a Mother's Day party. Pick one and let the party start! Party Packs are lifesavers and save you the hassle of going for individual pieces of cutlery or decorations. They contain tableware- forks, knives, spoons, plates, napkins and also decorations like- crepe paper, ribbons, balloons. They are also pretty economical and definitely get the job done. 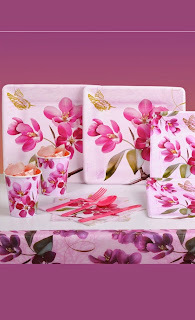 This Cherry Blossom Party Pack contains tableware such as plates and napkins bearing cherry blossom flowers. The decorations such as ribbons are similarly colored to create a single floral theme. 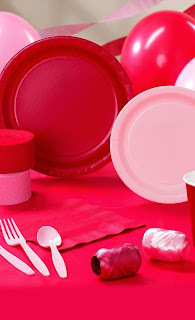 This Red and Pink Standard Pack is great for a Mother's Day party and any party for that matter. The red and light pink color combination is ideal for the party scene. This Pack contains the usual tableware (plates, cups, forks, knives etc.) and decorations (balloons, ribbons and crepe paper rolls). Mother's Day is the day for letting your mother know how much she means to you and how much you value her presence in your life. You can do so with words, cards and of course with gifts. It doesn't even have to be expensive, it just needs to be thoughtful and something she can actually use. So, you can't afford to gift a spa treatment to your mother. No worries, get her the next best thing with this cute Pedicure Set. It is funny, adorable and useful and makes for a perfect gift. Don't forget the hands! Just like your mother needs to take care of her feet (with a pedicure set), she also needs to take care of her hands. This Manicure Set, hilariously shaped like a purse, will make sure that your mom's hands and nails remain in pristine condition. Jewelry is a woman's best friend and rightly so! 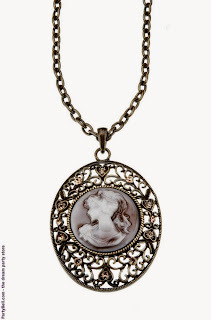 This Victorian Pendant with its rhinestone detailing and image of a beautiful woman in the center, will definitely make your mother swoon. Such trinkets hold emotional value and she will definitely cherish it for a long time. This pretty much wraps up our ideas on how to throw a great Mother's Day Party. Good Luck!